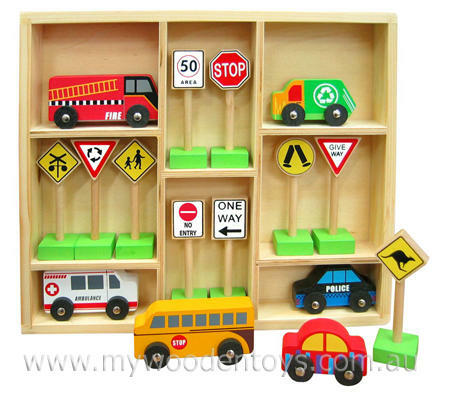 Tiny Trucks Road Sign Collection has six little vehicles and ten Australian road signs all in a wooden tray with eight compartments. There is an ambulance, police car, fire truck, bus, recycle truck, and sedan all with little wooden wheels and metal axles. The roads signs are a great collection of ten Aussie signs including a kangaroo, children crossing and stop sign. A great little set that can be packed away into its compartmented box... perfect! Size: The box is 26 x 22.5 x3cm. The ambulance 6.5cm long and 1.5cm wide. The wheels have a 1.5cm diameter. Signs are 8.5cm high. We like this because: "Wonderful little collection a great activity toy."